The key to a good Indie (i.e boutique) cigar is getting a memorable smoke. Once such cigar that fits the bill is the “Duke” – part of the Old School Cigars Originals line. This helped immediately make it memorable by name. While it wasn’t a perfect smoke for me, it did provide some uniqueness in what I look for from a Indie Cigar. For this review, I smoked “The Duke”. The Mexican Maduro wrapper has an extremely oily complexion. It also gave a look like this was going to be a powerhouse, but this was not the case. Upon the lighting and the initial taste, I got a combination of salt and acid that hit the tongue, but there was a layer of cedar spice that would soon will arise although the acidic tartness still remained in the early part of the smoke. 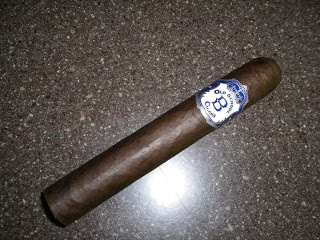 Overall, there was definitely more spice and tartness than I would expect for a big, dark, oily cigar. As I got down toward the 1/3 point, the tartness began to disappear and the taste of baker’s cocoa soon began to emerge and would compliment the cedar spice. Getting into the second third of the stick, the tartness would diminish and the baker’s cocoa would take center stage. The cedar spice was still there and now hints of wood emerged. Even though I was smoking this outdoors on a non-humid night with no wind, I did have an uneven burn throughout the second third. This taste basically remained until toward the end, but ultimately the uneven burn caused some tunneling at the end resulting in a harsher and more bitter finish than I would have liked. I took this cigar back from IPCPR two weeks ago, so it is possible I had some unstable humidification during the period I received this cigar until I lit it up. As for strength, the Old Schools Cigar web-site does list this as a Medium Strength. The complexity and flavors put this cigar more in the Medium “Plus” as opposed to Medium to Full. I have not had an easy time in finding this cigar at retailers. The only retailer I’ve seen the Old School Cigars line available at is The Stogie in Rockville Centre, NY (one of my favorite smoke shops). Ultimately, I did find this to be an Indie cigar that did provide some uniqueness. Flavor-wise, probably didn’t agree with me as much, but still worth checking out.